Otorrhea refers to a discharge that flows out of a person’s ears1. This condition is common and can be serious. It often occurs in children and is uncommon in adults. Otorrhea can become chronic when the middle ear is seriously infected and this is called chronic Suppurative Otis media. When chronic Suppurative Otis Media lasts for about 12 weeks, it becomes chronic otorrhea. The flow may consist of cerebrospinal fluids and it may be serous or purulent. This occurs when cerebrospinal fluids leaks from the ear structures. This leakage can be caused by several factors such as congenital defects of the ear structures; a baby is born with abnormalities in the ear which can trigger leakage of the fluid. Infections in the ear such as bacterial or viral can also cause cerebrospinal fluid to leak. Tumors that occur in the ear are also responsible for this discharge. A fracture on the skull as a result of a trauma such as falling from a tree, road accident or being hit by a heavy object on the head. Surgery that is done on the ear structures may cause injury to these structures and ear infections which may cause the fluid to seep out. CFS Otorrhea may also occur as result of a runny nose, also known as rhinorrhea. In a runny nose, the fluid comes out from the Eustachian tube which connects the middle ear to the pharynx. Another cause of CFS Otorrhea is poor communication or presence of a fistulous connection between subarachnoid space and tympanomastoid opening. This occurs especially in case an individual is at the risk of meningitis. It is also called purulent Otis media is characterized by a cloudy discharge. Purulent otorrhea might be caused by bacteria present in the Eustachian tube. Systemic infections in the ear may cause purulent otorrhea. It is also called tympanostomy tube otorrhea. It happens when an infected tympanostomy tube is inserted in the middle ear. Discharge usually comes out of the existing tympanostomy tube. 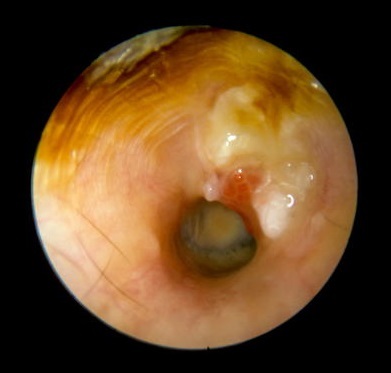 Sometimes discharge may occur within two weeks of placing the tube in the ear; this is referred to as onset otorrhea with tubes. When it occurs after two weeks of inserting the tube in the ear; it is called late onset otorrhea. Studies have revealed that 10 to 20% of children going through tympanostomy tube insertion develop otorrhea with tubes within two weeks. Acute diffuse Otitis externa – It occurs in people who like swimming and even those who bathe frequently. When swimming or bathing, water may be left in the middle ear which becomes a breeding ground for bacteria which causes an infection. The ear has earwax which is the ear’s defense mechanism against infections. Therefore when you constantly expose the ear to moisture, it destroys the earwax making you more prone to ear infections. You are the high risk of Otitis externa if you swim in water that contains many bacteria. Acute localized Otitis externa– This occurs when hair follicles of the ear are infected. Otomycosis- This where the ear canal is infected by fungus. Eczematous- It refers to many skin conditions that may affect the external ears such as eczema, psoriasis, lupus, etc. Apart from swimming in water that contains bacteria, Otitis externa can occur when the layer of the skin that lines the ear canal is injured. Scratching, use of earphones and inserting cotton pads in the ear can damage this delicate skin layer. An injured ear skin layer provides a good environment for bacteria which causes infections in the ear. Presence of objects in the ear. This is most common in children who like playing with objects and accidentally inserts them in the ear. Trauma- A head injury may cause cerebrospinal fluid to seep out from the brain since the skull is damaged or has a fracture. Ear pressure imbalance- The difference in pressure between the inside and outside of eardrum may damage the ear tissue. Patients feel pain in one or both ears which make them uncomfortable. They may experience partial loss in hearing. Patients also feel constant pressure inside the ear which is same as that they feel when they are in the water. They may experience sensations of stuffiness in the ear. In some cases, patients may bleed through the nose1. Tropical medications such as antibiotic eardrops are prescribed to treat otorrhea. The eardrops may be used together with steroids. For fungal infections, acetic solution is used when the infection is not severe. In most severe cases of fungal infection, antifungal topical such as clotrimazole is recommended. Patients are given pain relieving medications as a way of controlling pain felt in the ear. Pain killer drugs that may be recommended include nonsteroidal anti-inflammatory drugs (NSAIDs) which can be used to reduce pain as well lower inflammations in the ear. Acetaminophen which can be bought over-the-counter may also be used by patients. This method is used in most severe cases and in case there is large amounts of drainage in the ear. In some cases, abscess which is filled with pus may form in the ear. Abscess can be drained with a simple incision using a needle. Avoid self-afflicted trauma in the ear such inserting objects, use of cotton swabs in the ear. Do not wash your ear with soap since it may leave an alkaline residue which changes the pH of the ear. Stay away from swimming in contaminated water. Dry your ears with a towel after swimming. You can also use eardrop that has been mixed with alcohol to dry too much water in the ears after swimming.